During the mining boom, say from 2009 to 2013, the company I drove for had what was probably the heaviest regular long-distance run in the world. With heavy duty prime movers towing four trailers each, loaded with 100 tonne of powdered cement for an overall gross of 152 tonne, our fleet of 10-12 trucks delivered on average two loads a day from Perth to the Nifty copper mine in the Great Sandy Desert, east of Port Hedland, taking five days for the 4,000 km round trip. So for all that period the Nifty paste plant took a couple of hundred tonnes of cement each day, mixing it into a slurry of waste water and tailings which was pumped underground to backfill tunnels no longer required for extracting ore. In fact the basis of my employment as a tanker driver for 15 years was mines taking hundreds of tonnes of cement and lime – daily in the case of the bigger mines – for backfilling, waste treatment and ongoing construction. There are companies using quads – four trailer sets – all through the North, some with higher gross weights than we operated at, but most on leads of no more than 400 km, fuel tankers running out to the mines and side tippers delivering ore to port or processing plants where establishing a dedicated rail line was deemed uncommercial. But as far as I can tell, we were unique in the world for a long distance run at our weights. By comparison, European and American long distance trucks, “18 wheelers”, operate at 38 – 45 tonne, Australian b-doubles at 64T, double road trains at 80T and triples at 110T. My truck, “Buffalo”, was a Mack Titan with a 600 HP 15 litre Cummins diesel engine, an 18 speed Roadranger gearbox, and heavy duty drive axles with lockable diffs, a 48” sleeper cab with king single bed, and three airconditioners – one in the dash, one in the sleeper for when the truck was running, and another in the sleeper with its own powerpack for nights. Given that we were running out past Marble Bar, the hottest town in Australia, they were all needed! There was a big fridge under the bed, a 240v power supply, and storage lockers everywhere, but not quite enough headroom to stand between the seats. I had this Mack from new and drove it for six years. 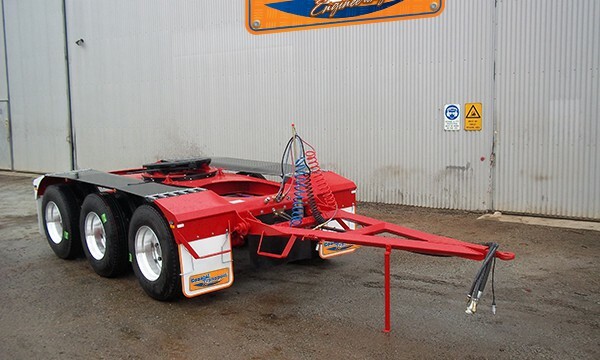 (a tri axle set with a drawbar to the trailer in front and a turntable to connect to and support the trailer being towed) behind my trailer, reverse it under the front of the b-double, set Road Train signs fore and aft and I was off. At this stage I was grossing about 110T (and I was still in the middle of Perth, so watch out who you cut in front of!). Round to the BP for fuel, 1,700 litres, and then I was really off. Round the airport onto Roe Highway to Great Northern Highway, through the vineyards of Upper Swan, stop at Gingers for coffee, fish & wedges, getting dark, through Bullsbrook, open road again, one last set of traffic lights at the intersection with Brand Highway (the coast road) and we’re into the hills. First climb Little Bindoon Hill to Chittering Roadhouse (very nice home made pies but keep going), cars and trucks backing up behind then swarming past in the short overtaking lane, down the other side through Bindoon and on to the one big climb, Bindoon Hill, hit it at 90 kph, then quickly back through the gears – top, hi split, lo split, 7th, 6th, 5th, into low range, 4th lo, will it hold?, it does, the engine barking, straining but not dropping back. 1700 RPM, 22kph. Up we go. It’s a precarious feeling, all that weight just waiting, for the engine to cough or the wheels to lose traction, to drag you backwards 2, 3 kilometres to the bottom again. Two bends, the road starts to level out, go to 1800 RPM grab 4 high, back into high range, 5 lo, we’re over, 5 hi, 6 lo, starting down the other side, using the engine now to hold us back, slowly gaining speed, round the first bend in 7 lo, letting go, rounding the last left-hander at 100 kph, a short valley and into the next hill, one steep pinch you can do in 5 lo, then over and flat out down a steep drop and one last short climb and that’s the worst of it. Do a walk around at the next parking bay then it’s more, gentler hills, jarrah and marri (big eucalypts) country still, only partially cleared, flattening out gradually as we slow through New Norcia, old stone convent buildings right up to the road, then the wheatbelt and little, half abandoned farming towns, Dalwallinu the prosperous exception, to Wubin, an old weatherboard roadhouse where everybody stops, and the roadtrain hookup – 20 hectares of sealed surface, trailers in a row and in disorganised ranks around them and on a dirt block too across the road when it’s really busy. Hopefully it’s around 9.30pm and I can pull up just short of town for a mandatory 7 hour break, away from the constant racket of fridge motors, ice packs, road trains assembling/disassembling, pulling up outside the roadhouse. Five am start, make coffee, down the street to the hookup, look for a dog (a trailer with a dolly at the front), there’ll be several but some of them will be empty, dropped by trucks heading home. This is the complicated bit: drop my b-double where there’s plenty of room in front of it, drive round to my dog, back onto it (now I have 2 trailers, are you keeping up? ), go back so I’m lined up ahead of the b-double, reverse onto it, make sure all the couplings (Ringfeders) are closed and locked, airlines connected, taps open (an easy one to forget till you get to the first long hill and find you have no brakes). Pull forward slowly in Lo/Lo – we have two ‘crawler’ gears below first – the engine roars, we’re off, moving slowly up through the gears, swing wide to miss the power pole at the exit, call out a warning on the CB, “roadtrain, quad, northbound from hookup”, pull out onto the highway, onto the dirt on the far side, watching in the mirror as that last trailer comes round the pole, straighten up, leaning into the weight, still only 30 kph as we crest the hill out of town. Then it’s bends, shallow hills, mallee and the northern fringes of the wheatbelt as we head out, through the westernmost edges of the Great Western Woodlands and into mostly acacia scrub, once sheep country, now largely ungrazed. Set the cruise control at 90 kph, but there’s still plenty of work to do, 200 km, past the two or three houses and the old roadhouse that make up Paynes Find, before the road levels out. Through the gold mining townships of Mt Magnet and Cue, stop for fuel at Meekatharra – 775 km, 900 L – then 400 km of gibber plains broken by (mostly) dry river crossings to Capricorn roadhouse outside Newman, stop for a shower, then on, heavy traffic from here on, trucks servicing all the iron ore mines along the way, workers’ utes, grey nomads (though far fewer than the coast road), quads hauling ore to Hedland. Up the big climb out of Newman, in the dirt, crushed ore really, off the bitumen if there are too many held up behind, much nicer country now, rocky but well treed, on the fringes of the Karajini ranges, past the turnoff to Tom Price, down the long descent through Munjina Gorge, past Auski, the sixth and last roadhouse between the outskirts of Perth and Port Hedland. Over the Fortescue River flats, up and on to a great grassy plateau, then down again, praying Andrew Forrest doesn’t have an ore train on the level crossing gifted him by a state government too servile to demand road/rail overpasses from the big miners. Dark now and lots of cattle. Time to find a parking bay. Five am, coffee, muesli bar, fruit, yoghurt, call in at Hedland for fuel, then out on the Broome road, 50 km, turnoff to Marble Bar, open, grassy cattle country into the Coongans, a rocky little mountain range, 10 kms of winding, single lane road, call out on the CB to negotiate right of way with the ore tipper quads coming the other way, then down to the T junction outside Marble Bar, plenty of parking, pull up for a walk around, my dash thermometer has shown 50 deg C here, then out on the Woodie Woodie road, one climb, Mt Everest, not bad eastbound but unrelentingly steep and long for the ore trucks coming the other way, make a run at it, back through the gears in a rush, there’s a vertical pinch at the top, if you’re shedding speed too quickly then it’s grab second before you come to a stop and crawl over. Coming the other way the ore trucks are under strict instructions to select second at the bottom and come all the way up at walking pace. Still they break down, drop trailers halfway up, sheer their tail shafts, so check at the top the road down is clear, you can see for miles, let her go, out across the plain to the next climb, over in 5th on a good day then down again, river crossings, concrete fords just above water level, ignore the turnoff to Telfer, 50 kms into Woodie Woodie, past admin, past the mine and out onto the Nifty road, 50 km of graded dirt and sand and twisty little hills, along a line of sparsely vegetated red sandhills and into Nifty. I’ve waited days to get unloaded at Nifty, sitting in a holding yard in the middle of nowhere, with other drivers or on my own, eating and sleeping in the camp; flew home once and came back two weeks later, after cyclone Rusty, when the road out was closed; have been held up by floods at Karalundi outside Meeka, at Kumarina and at Oakover River near the Telfer turnoff. Have got halfway up the incline on the edge of the pit to the paste plant, as in the pic at the top, lost traction in the rain, slid backwards, been towed up. Have had innumerable problems unloading, turning around in the tailings area to get back out, mud and water knee deep some days, till they finally, after years, made a road through for us. Held on after the boom on short hours and short trips hoping Nifty would come good again, or another contract like it, but it didn’t and here I am, in Brisbane today, driving twice the distance but only half the weight. Ah, those were the days!